Are you new to the nonprofit world? If you've never made a fundraising plan before, you've come to the right place! I've talked with many small nonprofits who are struggling to make their first fundraising plan. The first step to making a good fundraising plan is overcoming your assumptions. One of the things we assume when we start fundraising is that fundraising is just grants. Or, perhaps, that fundraising is sponsorships. But this assumption is incorrect. Why do we assume this? We might make this assumption because our first exposure to fundraising when we were younger was grants or sponsorships. You can get grants or scholarships to go to college. And you see that big events, such as races and walks, are often sponsored by corporations. When I first started fundraising, I was doing a 26-mile walk, the Walk for Hunger in Boston, with my church group. The t-shirts we got for the walk-a- thon had all of these sponsor logos on the back of them. When I decided to start fundraising as a career, I immediately thought, well, we just need to get lots of sponsorships and some grants, and we'll be all set! How wrong I was! When I left my full-time nonprofit job, I thought that I knew a lot about fundraising and that I was pretty competent at it. Let me tell you, after five years of blogging, teaching, eating and breathing fundraising, I was ignorant, even after working for nonprofits full time for years! There is just so much to learn. Even if you've been in fundraising for a few years, your nonprofit has so many ways to get money and build relationships. Look at this list and see if there are some you don't recognize or ones you'd like to learn more about. I could go on about the different ways to fundraise, but you get the idea, right? There are tons of ways to fundraise, many more than the average fundraising professional thinks about. And even more ways than the average nonprofit founder thinks about. 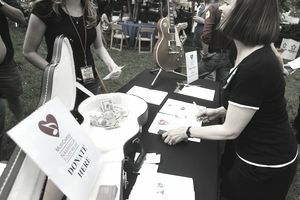 With so many different ways to fundraise, how do you choose which ones to do? Which ones should you include in your fundraising plan? Here's my advice to you - focus on what works. According to GivingUSA, in 2012 most of the charitable giving in the US (about 72 percent) came from individuals. Around 15 percent was raised from foundations, another 6 percent came from corporations, and a small sliver was raised from planned gifts. Question your assumptions. Don't focus on grants. Don't concentrate on corporate sponsorships. The thing that works the best and gives you the maximum dollars for your time spent is asking someone for money face-to-face. That works about 50 percent of the time. The next is a personal phone call to someone you know. That works about 25 percent of the time. The next best thing is a personal letter to someone you know. That works about 10-15 percent of the time. Direct mail letters typically only get a 1-3 percent return. Special events are the worst way to make money and bring in the least return for the most effort. When creating your first fundraising plan, take the non-intuitive route. Fundraising is not about hunches and opinions. It's about facts and science and experience. So when you create your first fundraising plan, focus on major gifts, phone calls, and personal letters. Here's another assumption people have. They think that if they're doing major gifts, they have to cozy up to a lot of rich people. This assumption is incorrect. You don't have to know a lot of rich people. The most generous people, statistically, are the ones who make under $50,000 per year. That is most people. Like my heroine, Kim Klein (former editor of the Grassroots Fundraising Journal), says, “You already know everyone you need to know to raise all of the money you need to raise.” You can start your major gifts program with small monthly gifts from your most loyal donors. Who are your most loyal donors? People who gave twice in the last 12 months. People who have given once a year for the previous three years. Or people who have given over a certain dollar amount to your cause. Now you know that your first fundraising plan should include major gifts, monthly donations, and personal phone calls.Write out who is responsible for each set of fundraising tasks, what the tasks are when they will get done, and how much they will cost, as well as the goal amount you are trying to raise. Open up a spreadsheet on your computer and put these headers at the top of your spreadsheet. Then start filling it in. Just remember, fundraising is hard, but with the right team and by focusing on the right things with your fundraising plan, you can succeed! Mazarine Treyz is a fundraising ninja. She’s been advising nonprofits through her consulting work, teaching, and with her blog at Wild Woman Fundraising. Click on her byline for more info.